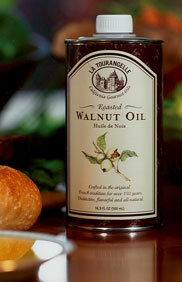 La Tourangelle's Walnut Oil, Almond Oil, Pecan Oil and Pistachio Oil are made with nuts grown in sunny California. La Tourangelle's Roasted Pistachio Oil is a 2008 finalist in the National Association for the Specialty Food Trade awards, in the Outstanding Oil category. 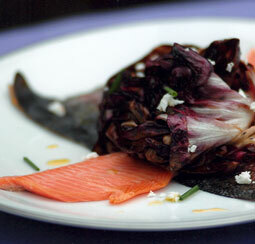 Ms. Berne suggests serving La Tourangelle Walnut Oil on a salad of slightly bitter greens, topped with thin slices of pear, crumbled blue cheese…and walnuts. Abraham Lincoln had yet to be elected president when Mr. Morillon and Mr. Bechet founded La Tourangelle, a small animal-powered oil mill, in the idyllic French town of Saumur. Originally, each French village had a mill that roasted and extracted the oil from nuts gathered by local farmers. La Tourangelle is one of just a handful of these remaining mills that keep this tradition alive. Over the next century and a half, the company refined their production processes and adopted appropriate technologies that honored this artisanal beginning. In the last decade ownership passed to the Kohlmeyer family, and eldest son Matthieu moved to California's Bay Area to recreate his family's French artisan oil mill. To replicate the century-old equipment, he had to have it custom-made and his American staff was then trained by an oil-roasting artisan from France. The new oil mill in Woodland, California, produces oil from walnuts grown on the orchard next door. The highest quality nuts are selected, dried naturally in the sun to preserve their natural flavors, hand roasted in cast iron pots, cold-pressed and lightly filtered. These elegant oils each have their own unique flavors. The cast iron pots used to roast the nuts came from the mill in France, and they are as critical to the process as the artisanal know-how. “If you simply press a fresh walnut, the oil you get is bitter and lacking character. But when the nuts are sun-dried, then roasted just perfectly, the rich flavor of the nuts is brought out in the oil,” explains Matthieu. In addition to adding a flavor component to foods, walnuts contain omega-3 fatty acid, a polyunsaturated fat that can lower blood cholesterol levels and may reduce the risk of heart disease according to a study published in the Archives of Internal Medicine in 2002. Since La Tourangelle’s oil is not refined and no chemicals are used in the extraction process, these health benefits are preserved in the oil. A great deal has occurred in the world since La Tourangelle first began handcrafting walnut oil in France, but their traditional process has remained virtually the same. The only difference is that now the oil can be enjoyed fresh from California.